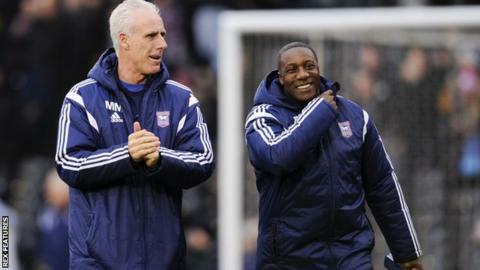 Ipswich Town manager Mick McCarthy and assistant Terry Connor have extended their contracts with the club. The pair, who have been at Portman Road since November 2012, will now remain with Ipswich until the summer of 2018, with the option of two further years. Former Republic of Ireland, Sunderland and Wolves boss McCarthy, 56, has guided the Tractor Boys to seventh in the Championship this season. "We are really enjoying the job here," McCarthy told the club website. "The results on the pitch have improved year on year. In a relentless and tough league that the Championship is, that is testament to the hard work the players have put in." Last season Ipswich reached the Championship play-off semi-finals, but lost to local rivals Norwich City. McCarthy's side, who were knocked out of the FA Cup by League Two Portsmouth on Tuesday, go into Saturday's game against Birmingham City on a five-match unbeaten run in the league.